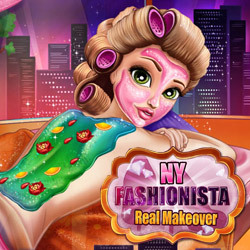 Description: Join this glamorous fashionista in a stunning real makeover that takes place right in the middle of New York. Clean up her face and back using spa beauty treatments and help her relax, the rush of the city can be quite overwhelming. Move forward to the makeup stage and choose a colorful eyeshadow, blush and lipstick that match her style. Go through the wardrobe and pick up a super awesome outfit, you're now ready to rock the city and have fun!